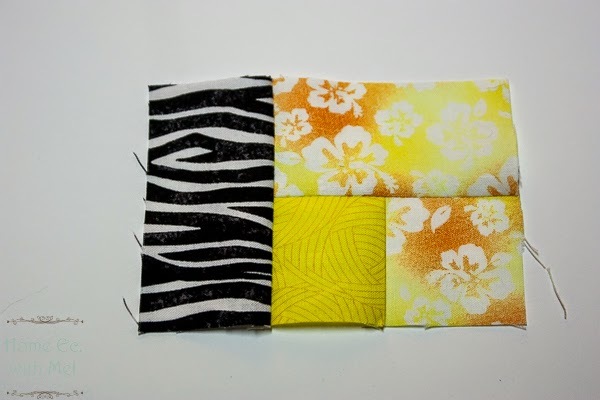 Today we take that pile of strips and turn them into log cabin quilt blocks. 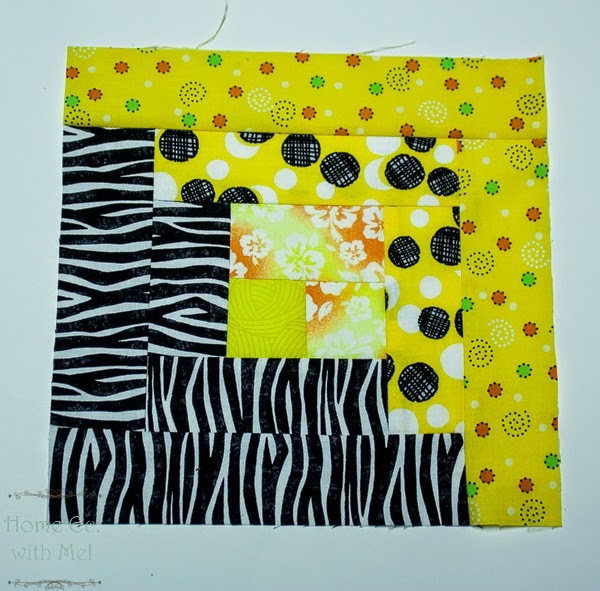 Once you have the quilt blocks made you could set them together however you want, of course we are going to make ours in a chevron design but that's getting ahead of ourselves. 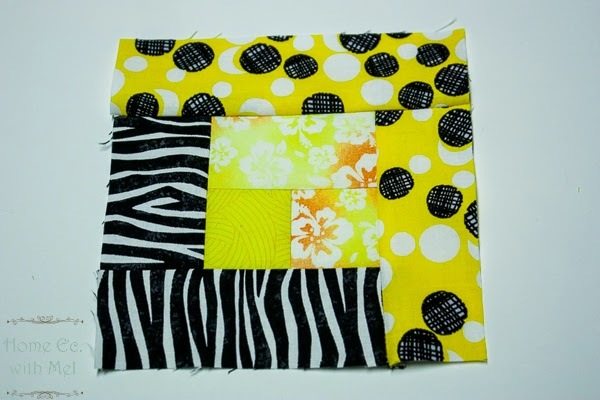 The log cabin block is easy to sew together. It really requires very little from you other than an accurate quarter of an inch seam. 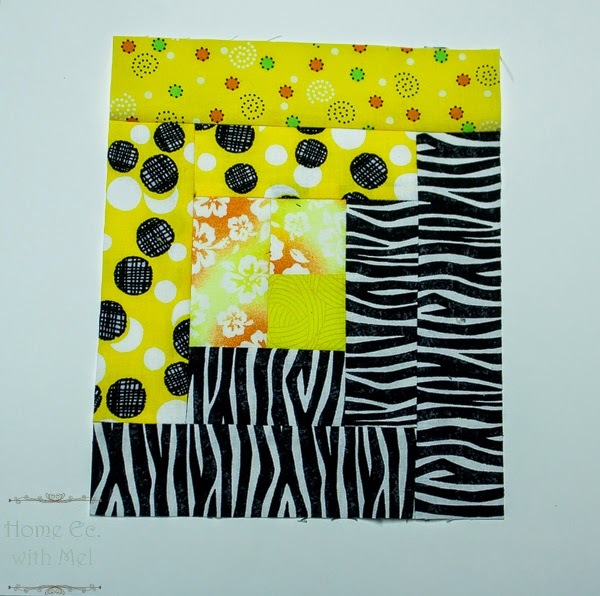 Once you have that down you are ready to sew up some patchwork quilt blocks. 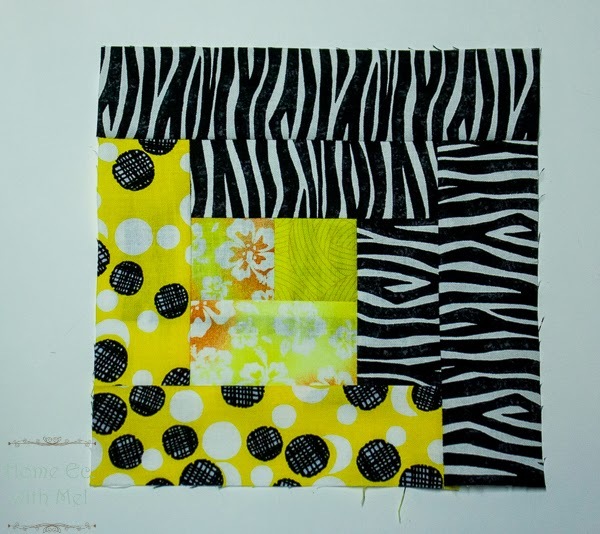 So to start our quilt we need to take our strip of center fabric and one of our first light. 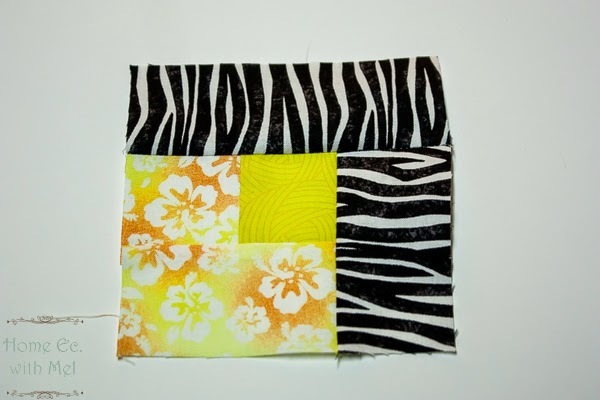 We always sew right sides together or printed side to printed side. So we need to put our strips together like that. We also need to make sure our edges are lined up. Are you still with me? Good now we head over to the sewing machine. We'll sew with a regular 1/4 inch seam. If you need help I have a 1/4 inch seam tip post. Go slowly if you need to but keep those edges together and the seam straight. I have a 1/4 inch foot on my machine. So I'll sew with the edge of my fabric against the edge of my foot. That wasn't too hard. You should know have to pieces of fabric sewn together. So now it's off to the ironing board. We'll set the seam and press it open. Let's set the seam. That's when we press where we just sewed. It helps set the stitches into the fabric. Now we have to press the fabric open. You want your darkest fabric on top. That's what we will press our seam to, it helps hide it. 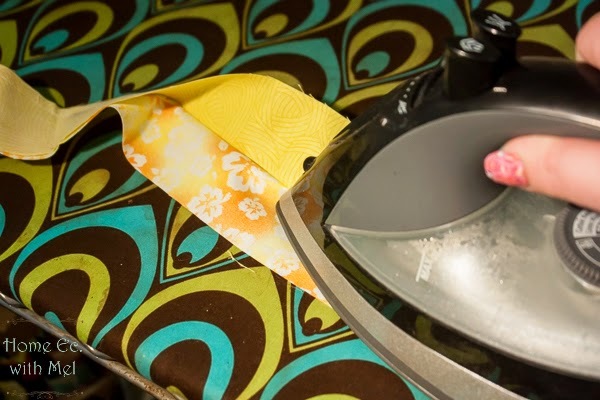 As you can see in the picture I'm using the iron to press it open. I press towards the center fabric or whatever fabric is on top. Iron from bottom to top. So now you should have a piece of fabric that looks like this. Stick with me folks only two more steps to really explain and then we just keep repeating the same thing over and over and over. Now we have to cut our strip up into 2" segments. Our first step is to even up the edges. Now we'll cut them up into 2" segments. 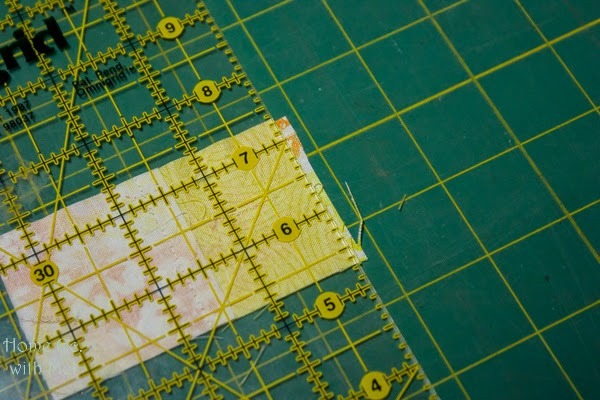 Make sure your strip is straight on your cutting mat, if you need to use the lines do so! There's nothing wrong with that. 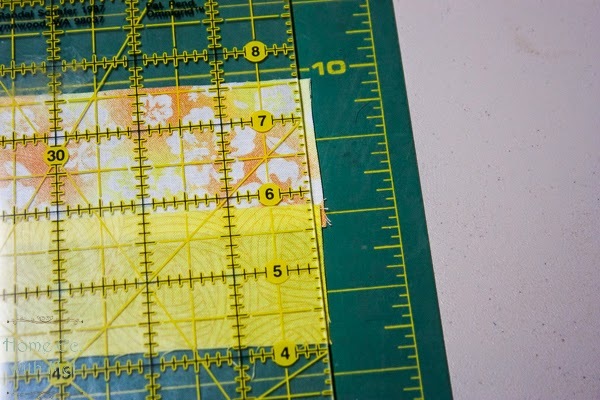 Line your straight edge up with one of the lines on your mat and then move your ruler over two squares, that's 2 inches, and cut the fabric just like we did to make our strips. Keep doing this until you run out of fabric. You should have 20. 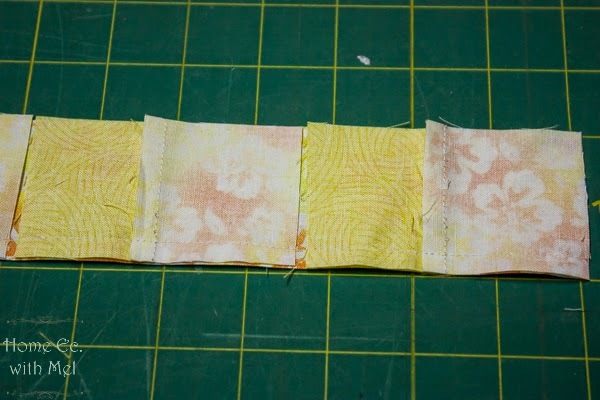 If not you can cut another strip, if you have extra double check them or you bought really wide fabric. Now we go back to the sewing machine. You need all of your little 2"segments you just made and a strip of your first light. 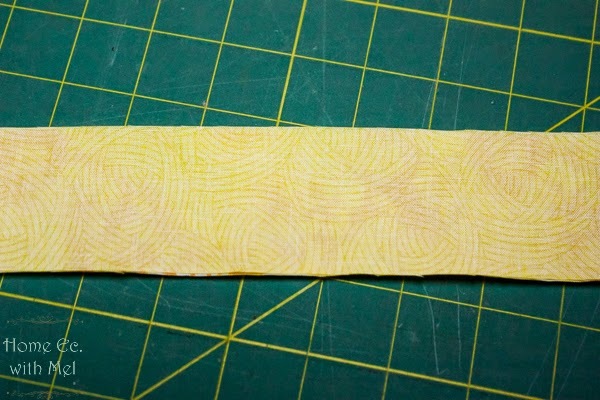 Lay your strip face up and lay one segment on top. 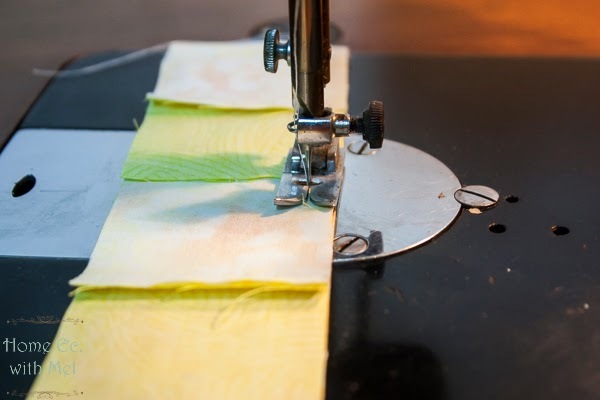 The seam you just sewed should be the first seam you sew over. Now we are going to sew to almost the end of our segment. Lets add another segment now. 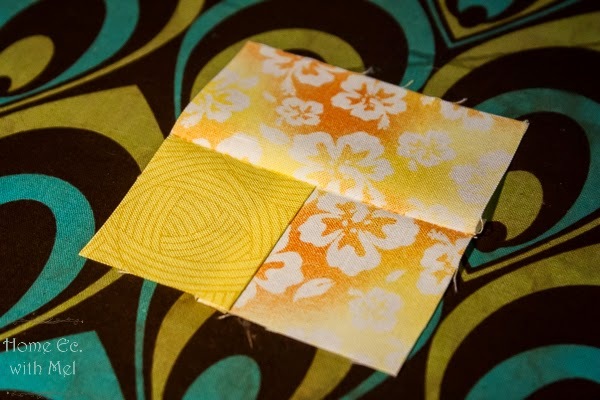 You'll have just a little bit of fabric between each segment. You'll keep doing this until you can't fit another segment on the strip. Though you should be able to get all of them on in this step. When you are done you should have a strip that looks like this. 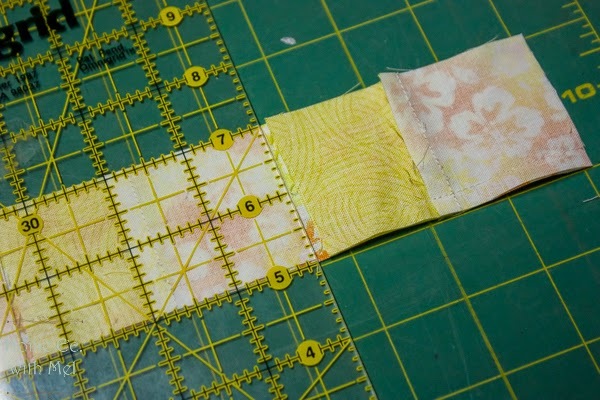 I use my sewn edge to keep my strip straight on my cutting mat. 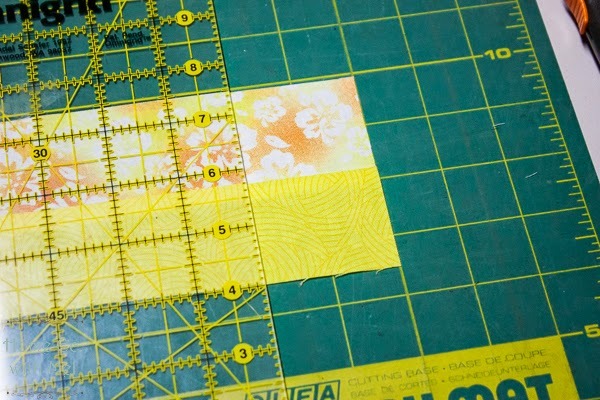 I line my ruler up on the second segment and cut off the first. Once I have them all cut apart I go back and trim off that little sliver over fabric. 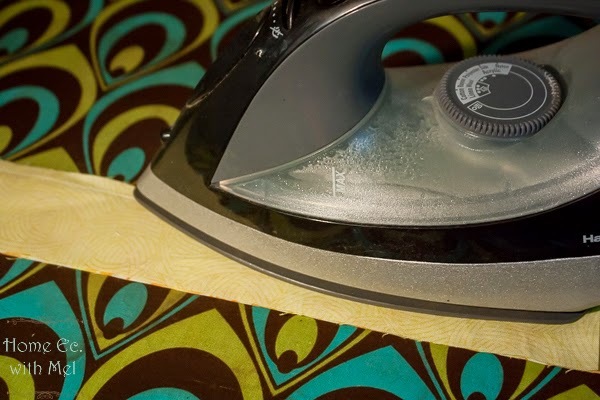 Now it's time to iron again. Set your seam just like we did before and then press it open. 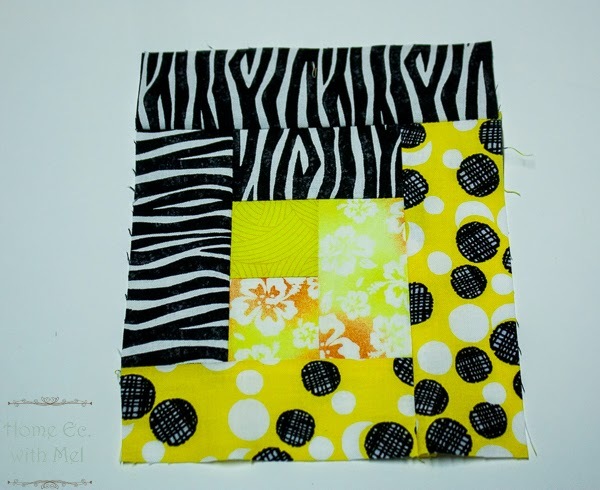 I normally put the piece I just sewed on on top and press to it. You'll end up with this. Now we just keep repeating with each of our strips. So now we need one strip of our first dark. 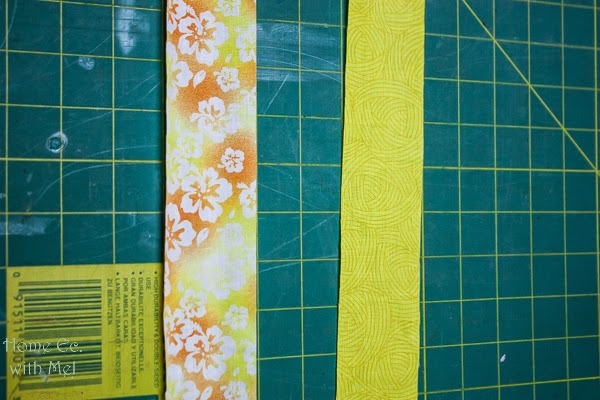 We'll sew the our new segments on this strip just like we did the other segments. You won't be able to fit them all on and that's OK. Just put the leftovers up for right now. You'll cut them apart and press them open just like before. You should now have a segment that looks like this. Ok now we grab another strip of your first dark. 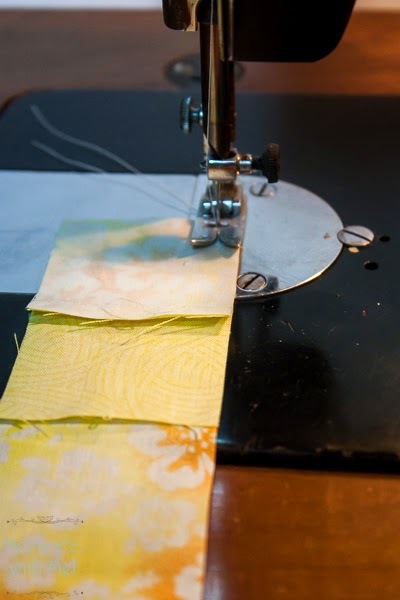 Remember the seam you just sewed goes at the top and is the first seam you sew over. We need to sew these segments on just like before. The cut and iron them again just like before. You probably won't get all of your segments on and that's OK just set the extras to the side. Your block should look similar to this. Now we grab a strip of your second light. 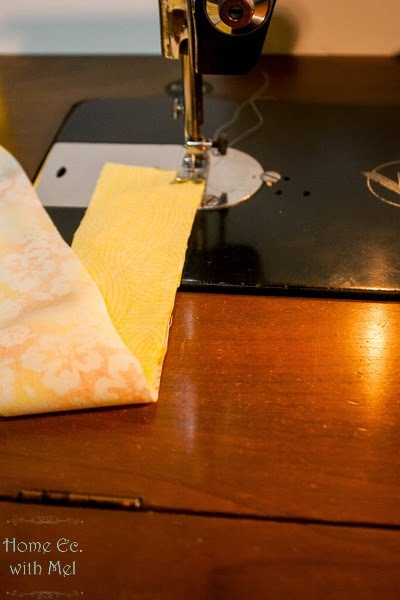 Remember the seam you just sewed goes at the top and is the first seam you sew over. We need to sew these segments on just like before. The cut and iron them again just like before. You probably won't get all of your segments on and that's OK just set the extras to the side. Your block should look similar to this. Ok now we grab another strip of your second light. 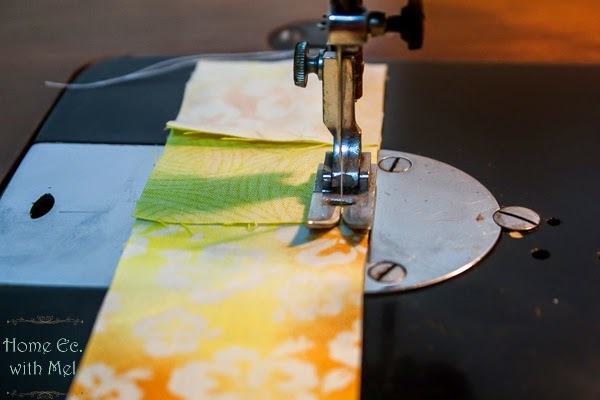 Remember the seam you just sewed goes at the top and is the first seam you sew over. We need to sew these segments on just like before. The cut and iron them again just like before. You probably won't get all of your segments on and that's OK just set the extras to the side. Your block should look similar to this. I think you've got the system down. 2 darks and then 2 lights keeping your extra segments off to the side. So from now on I'll just show you each step. WOOO HOOO!! You just completed four log cabin blocks. 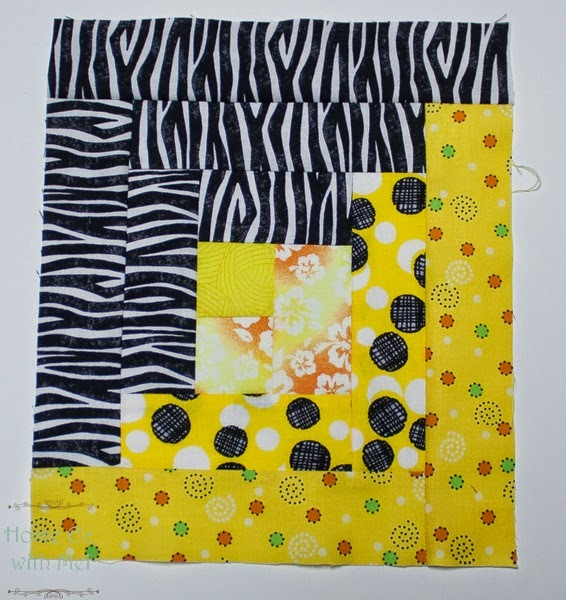 It probably took you longer to read this post than it will to actually make the four blocks. 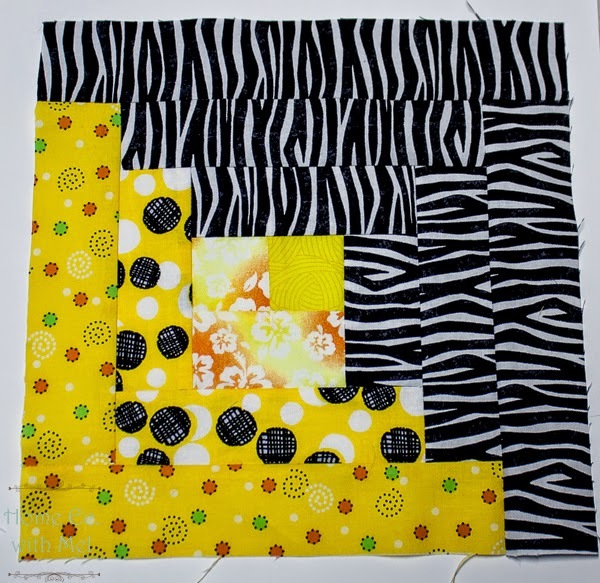 Now it's time to go back to those leftover segments and start the process all over again making another complete set of four blocks each time. You need twenty blocks total. Shared on twitter and Pinterest! So cute. 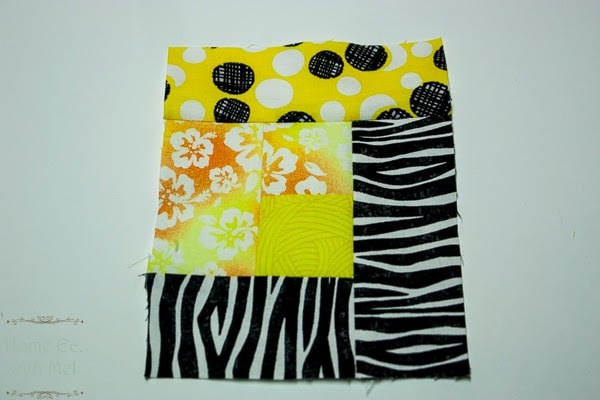 You make quilting look so easy. May give it another try :). Thanks for sharing! This is a very unique blog. I love it!